When I first arrived in Italy I couldn’t believe I was actually there. 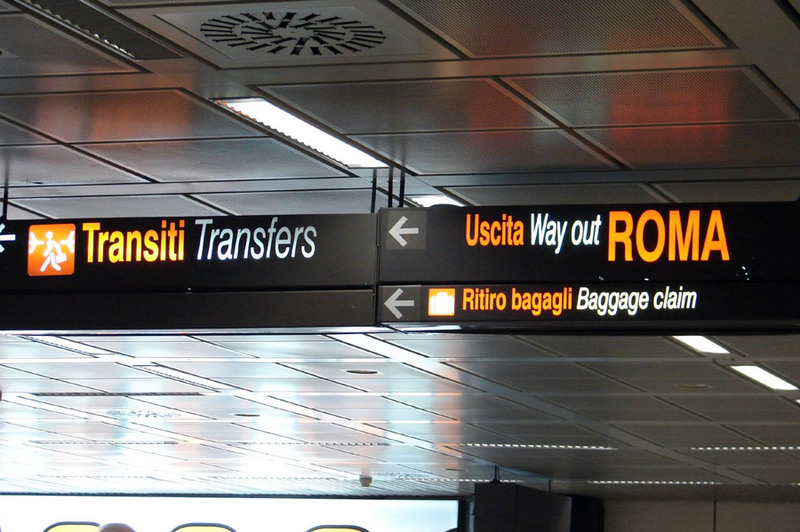 Reality started to set in as I made my way to the baggage claim in the Fiumicino Airport and heard the announcements being made in Italian. I watched the baggage carousel go around hundreds of times without seeing my luggage; turns out my luggage was on it’s own trip and was now somewhere between Philadelphia and Frankfurt, Germany. I was forced to begin my trip of a lifetime in Rome without my essentials. As I traveled by shuttle from the airport to my hotel, I worried the entire way. I was not only in a foreign country but I was alone with no one to rely on but myself. There was no K-Mart or Target to dash into and grab a few quick items to carry me over. I started to doubt the rest of my trip since it was starting out on such a sour note. After I checked into my hotel, Patty, the kind lady who had turned the bulk of her home into the quaint Hotel Boccaccio, reassured me that all would be well in a few days; she even called the airport for me to check on my luggage. If you ever go to Rome, check out her hotel, you won’t be disappointed! 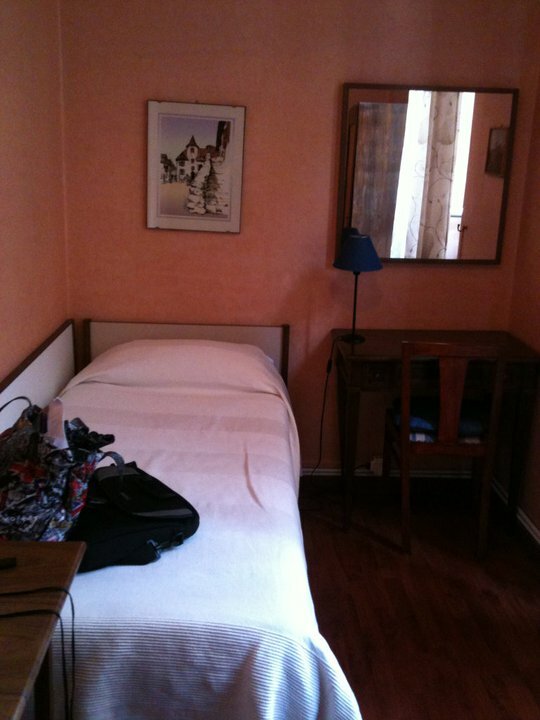 I went to my room, which was a simple bedroom with a single bed, desk and sink; there was a shared bathroom down the hall, which was common in a European bed and breakfast. 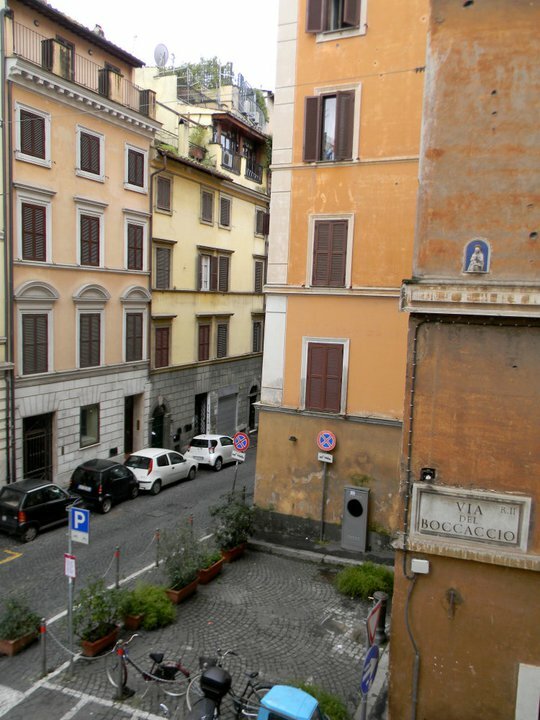 I opened the window of my room and looked at the street down below; I saw the signature Italian Vespa motorbikes, just like in the movies, zooming around the narrow Via del Boccaccio. Immediately across the way on the facing building was a sculpture of the Madonna and child set against a blue background; it appeared as if she were watching over the street and protecting all around. I started to feel a bit of peace in my soul. I refused to allow my lost luggage to morph into psychological baggage that would weigh me down and hold me back from enjoying my trip; that would be precious time wasted wallowing in misery. Instead, I decided to go and explore the streets of Rome. My maps and travel guides I put together for my trip were not with me, so I decided to wing it. Just steps away from my hotel there were already so many sights, sounds and smells to take in. I admired the quaint trattorias and ristorantes that were so welcoming, with al fresco dining areas lining the old uneven cobblestoned alleys and streets. 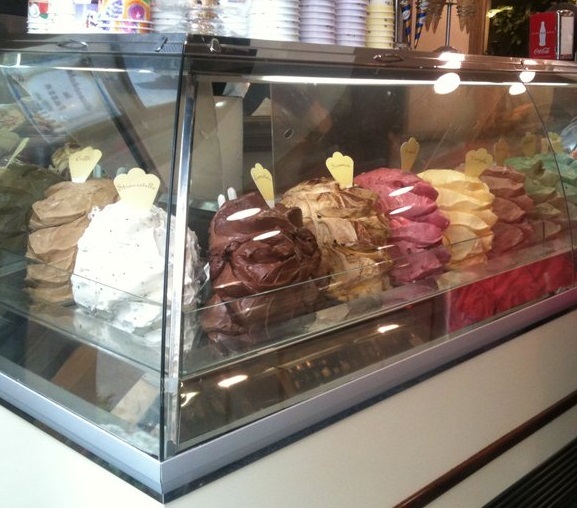 Even the gelaterias begged for attention with their fluffy clouds of sweet goodness beaconing you to sample their flavors. As I turned the corner following the throngs of people enjoying la passagiata, the evening stroll after work hours, I heard a fountain in the distance. 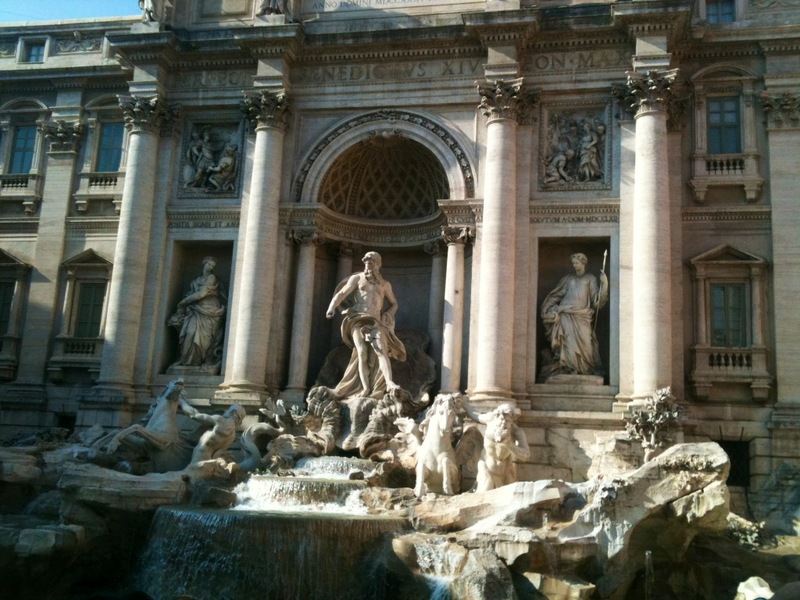 I had no map, so I didn’t know where I was; and then it came into sight – the famous Fontana di Trevi – The Trevi Fountain itself. Reality really hit a homerun and my heart skipped a beat; I couldn’t believe I was standing in front of the fountain I had only seen in movies like Fellini’s classic La Dolce Vita and the 1950’s movie, Three Coins in the Fountain. I stood and admired the fountain, watching people cast their coins into the water. It is said that to toss a coin over your left shoulder with your right hand into the fountain ensured your return trip to Rome. There are many variations I have heard from people over the years such as: to toss two coins into the fountain brought marriage and three a divorce or instead of tossing the one coin over your shoulder to ensure your return, you toss three at once. As I joined the throngs of people at the base of the fountain, I opted for the tradition my English Literature and Latin teacher from high school taught me – you toss three coins, one at a time, over your left shoulder: one for your return, one for love and one for your wish. I combined my wish and the coin for love, as I wished to find the love of my life; a little back-up never hurts in the wish department! I stepped away from the base of the fountain and found a seat so that I could admire the colossal and ornate beauty of the fountain. Since my camera bag was in with the rest of my luggage enroute to me, I took out my iPhone and snapped a photo. When I had taken in enough of the fountain for the night, I resumed my walk around the narrow streets of Rome. Next on my journey I found the Via del Corso, Rome’s main street and the Piazza Colonna, with the Column of Marcus Aurelius standing tall in the twilight. Children and teens were playing in the open space of the piazza, with the adults not the least bit concerned that someone might make off with their child, as would be commonplace in America. There was a friendly and peaceful vibe to this city and its inhabitants; I soaked up as much as I could of the positive energy that was emanating from every direction. 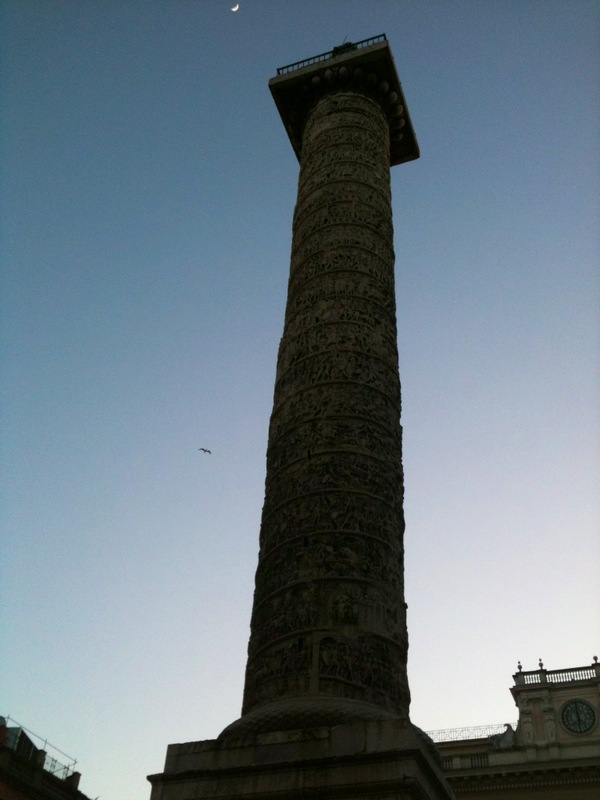 I found that I was quickly falling in love with Rome. On my way back to the hotel, I happened upon a clothing store reminiscent of Dots and decided that would be my first stop the next day, to tide me over until my luggage arrived. Crisis averted! No luggage? No problem! I got this! No emotional baggage was allowed on this trip. I could now return my focus to the Eternal City and living it up for the next two weeks.